A, B, C, Disgusting by Catherine Dawgert is a children's book with a hilarious new twist in a parent's effort to teach kids the alphabet, with animals doing all manner of yucky things...some real, some imagined, and all seriously entertaining. Starting with the letter A and going straight through to Z, this isn't the standard issue of apples to zebras (except when that particular zebra has zits). Each letter features a member of the animal kingdom and follows with whichever odious bodily function, ailment, or condition the animal has, with the same letter, of course. The text is then accompanied by a creative illustration that is equal parts ingenious and ill-bred for a brilliant compilation that children will not soon forget. 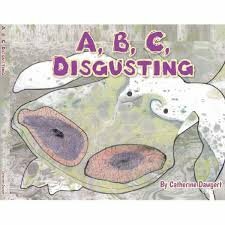 A, B, C, Disgusting by Catherine Dawgert is not just for kids. I am totally comfortable admitting that I laughed just as hard as my young nephew, who especially loved the letter M, for mounds of multicolored moose mucous, and a delightful illustration of a parent and youngster moose oozing snot from their noses in glorious technicolor. For myself, the standout was the letter C, for crusty camel conjunctiva, which required a quick search online to discover what conjunctiva actually is. See? Dawgert taught me something too! On a serious note, the author, who also did the book's illustrations, has done a fantastic job of making one task easier for parents: creating a learning tool that is also fun. I wholeheartedly recommend this gem to both adults and children who could use a little more humor in their daily life.